The leadership of the surface transportation panel in the U.S. Senate and other senior freight policymakers were among candidates cruising to victory Nov. 6 in the first midterm elections of President Donald Trump’s tenure. Environment and Public Works Committee chairman, Sen. John Barrasso (R-Wyo. ), topped Democratic challenger Gary Trauner in a race that was never in doubt. 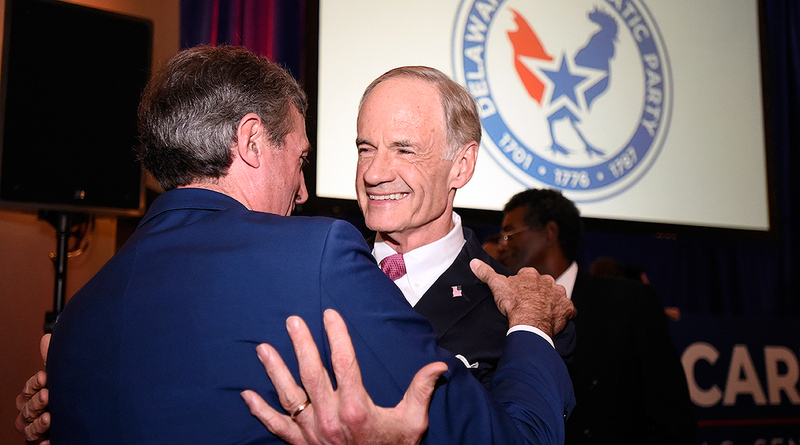 The committee’s ranking Democrat, Delaware Sen. Tom Carper, also easily defeated Republican Robert Arlett. In the past two years, Barrasso and Carper have collaborated on water policy legislation, and oversaw high-profile hearings with the Trump administration’s environment chief and Secretary of Transportation to discuss infrastructure policy. Carper, a senior decision-maker on freight policy, is among the few lawmakers on Capitol Hill supportive of a fuel-tax increase that would be designed to help realize a long-term infrastructure funding plan. The senator from Delaware also has promoted highway safety, while pushing back on a Trump-led 10-year, $1.5 trillion infrastructure funding plan that would rely primarily on private sector dollars to advance projects. Incumbent Texas Republican Sen. Ted Cruz, a member of the Commerce Committee with jurisdiction over trucking policy, narrowly fended off the bid from Rep. Beto O’Rourke (D) in what became a race that captured the country’s attention. Cruz, a proponent of commercial space travel and freight safety programs, ran on a social conservative agenda. O’Rourke campaigned as the alternative to Cruz’s brand of governing and thin legislative record. New Jersey Sen. Bob Menendez (D) won despite having been hampered by recent high-profile court battles and being portrayed as corrupt by his opponent, Bob Hugin. The Republican challenger, a former pharmaceutical executive, had distanced himself from Trump and self-financed an ambitious campaign in an attempt to win in the traditionally Democratic Garden State. Menendez has his fingers on the pulse of freight and transit policy as ranking member of the subcommittee on Housing, Transportation, and Community Development. Pennsylvania’s incumbent Democratic Sen. Bob Casey defeated Republican Rep. Lou Barletta, chairman of the Economic Development, Public Buildings and Emergency Management Subcommittee. Casey has been a consistent voice on the needs for establishing efficient freight corridors. With a seat on the influential Finance Committee he will be among the lawmakers to watch as Congress looks to revamp the Highway Trust Fund, the authority of which expires in 2020. States are helped with funds from the account for infrastructure projects. In the House, Rep. Peter DeFazio (D-Ore.), who will likely be named chairman of the Transportation and Infrastructure panel, was re-elected after defeating Republican challenger Art Robinson. DeFazio is the panel’s ranking member and, like Carper, has backed raising fuel taxes to fund large-scale infrastructure projects. Elected in 1986, DeFazio has a deep knowledge of transportation policy and federal oversight machinations. Republican Rep. Sam Graves of Missouri, chairman of the Highways and Transit Subcommittee, easily defeated Democrat Henry Martin in the state’s 6th District. Graves is expected to pursue the ranking member spot on the full committee. In California’s 10th District, incumbent Republican Rep. Jeff Denham and Democrat Josh Harder are still in a dead heat. Denham also is likely to pursue the Transportation panel’s ranking member seat if he is re-elected. Nov. 13 update: Harder defeats Denham. Florida Republican Rep. Mario Diaz-Balart, chairman of the transportation appropriations subpanel, defeated Democrat Mary Barzee Flores. He may likely take over the role of ranking member on the influential subcommittee with jurisdiction over the U.S. Department of Transportation’s budget. In Montana, incumbent Democrat Sen. Jon Tester narrowly defeated his Republican opponent, state auditor Matt Rosendale. Tester is a member of the powerful Appropriations Committee. Republicans on the House Transportation and Infrastructure Committee not returning to Capitol Hill include New York’s John Faso, Minnesota’s Jason Lewis and Virginia’s Barbara Comstock. Nevada Republican Sen. Dean Heller, a member of the Commerce Committee, also will not be returning to Washington after losing to Rep. Jaclyn Rosen (D). Throughout the campaign season, few candidates highlighted infrastructure policy in debates, town halls and advertisements. Most Republicans opted to follow Trump’s lead and campaign on immigration policy. Many Democrats stuck with health care and pledged to voters that they would safeguard coverage for individuals with pre-existing conditions. Meanwhile, the Florida Senate battle between incumbent Bill Nelson (D) and Republican Gov. Rick Scott was too close to call before this edition went to print and could end up in a recount. Nelson, elected in 2000, is the top Democrat on the Commerce Committee.